Hula Hooping Mom: See it. Stream it. **Disclosure: This is a compensated feature in partnership with Best Buy. All opinions are of our own. I remember years ago we would have so many different devices in the home, each for streaming something different. 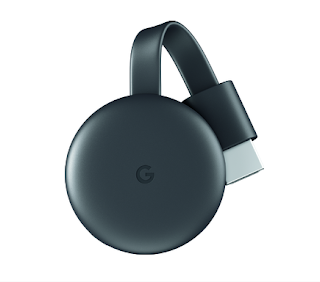 With the Google Chromecast it's almost as if all of those devices have been squeezed into this tiny, out of the way, unnoticeable device! It's pretty awesome and we love it! All together now - watch movies, shows, live TV, YouTube and even your own photos streaming on your TV from all of your families devices. It's super simple! Stream right from your own phone to you TV. Plug Chromecast into the HDMI port on your TV. Power and stream your favorite entertainment right from your phone with just a tap. Watch shows, listen to playlists and more. On top of that, while streaming you can still use your phone as you normally do. The Chromecast works with the streaming apps you know and love. Enjoy TV shows, movies, videos, songs, games, sports and much more from over 2000 apps like Netflix, YouTube TV and HBO NOW. See the full list here. A cool feature is that you can stream with your voice? Have food in one hand and the baby in another? Just say what you want to watch from compatible apps and control your TV hands-free with Chromecast and Google Home working seamlessly together. Upgrade your TV for less. We love the affordability this device brings for all it has to offer! It's so affordable you can get one for every room in the house. Only $35 at Best Buy! We highly recommend this product! There is two things we love - affordability & variety! Can't get any better than that, especially when it's saving us money! Pick one up at Best Buy for only $35!